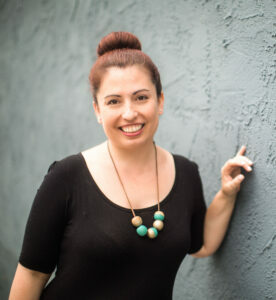 Sharon: The rise of DIY small business tools in the last year has been incredible… and so needed for makers who are looking to create one-of-a-kind products and look professional while not having a giant corporate budget. 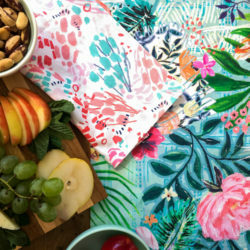 While you may think of Spoonflower as the place to get unique, artist designed fabric, wallpaper and wrapping paper for personal projects, it is also the place where handmade businesses can go for custom, professional items without breaking the bank. 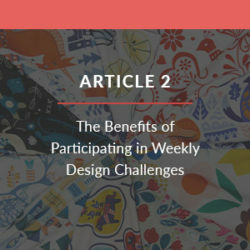 As someone who works with makers to help them improve their businesses, I love the possibilities Spoonflower presents! Many of Academy of Handmade’s members are using Spoonflower on a daily basis in their businesses. Here are a few examples I found from both our members and other makers. 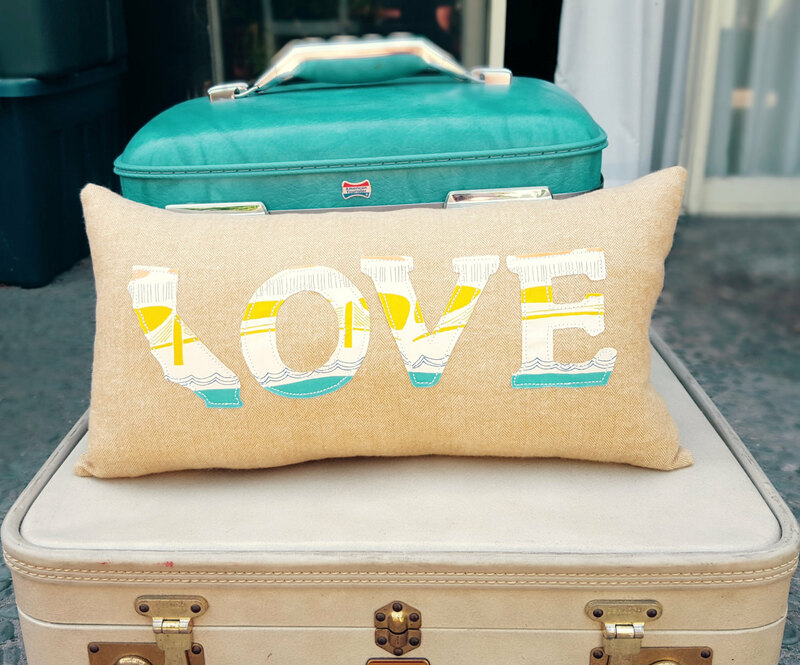 You might have looked online at some of the custom signage options for your craft show booth. 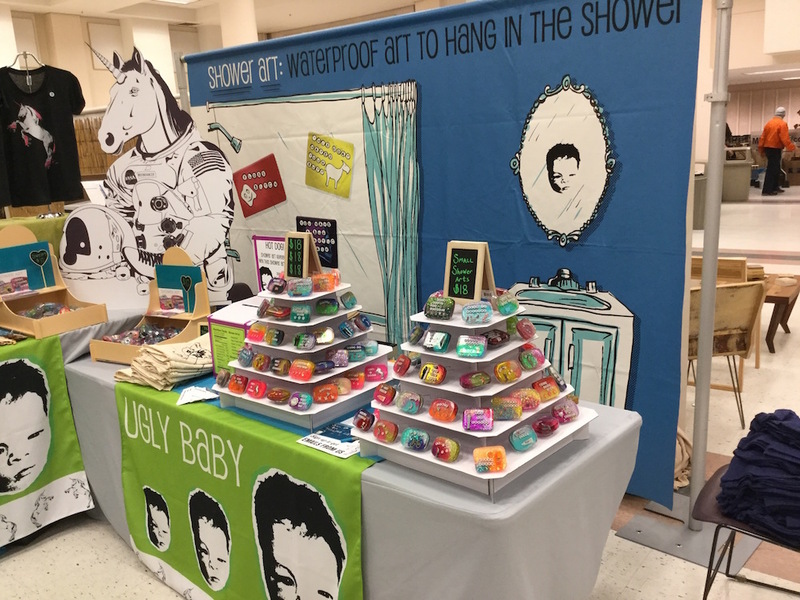 Spoonflower allows you to make something beyond the “typical vinyl banner” but doesn’t break the bank the way many custom booth branding can. Academy of Handmade member Rosalie Gale of Ugly Baby, uses printed Spoonflower fabric to drape over her tables. Which is so smart because one of my biggest things with booths at craft shows is that a booth’s branding is usually only in one place–on a sign behind the booth–when it needs to be ALL over. Another great booth branding idea is to use custom-designed wallpaper to apply to any hard surfaces that might be part of your display, like a sandwich board or sign. 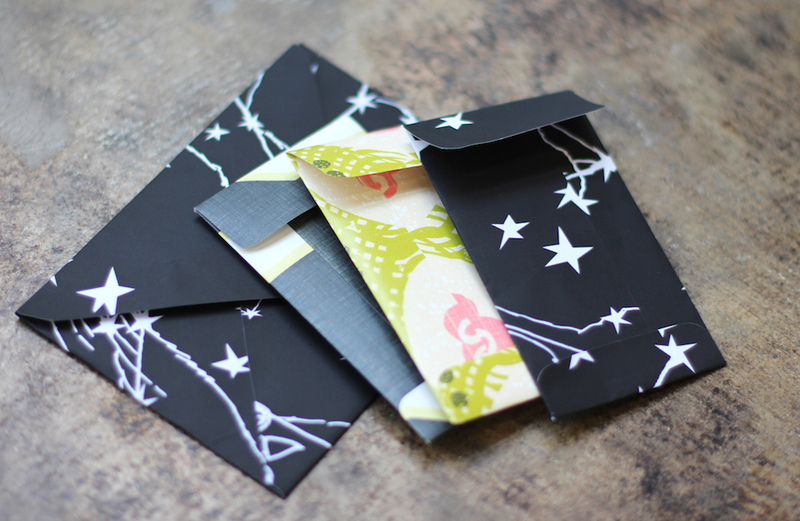 You might also want to consider making a wrapping paper and cutting it up to to make a garland that will be perfectly complement your products. 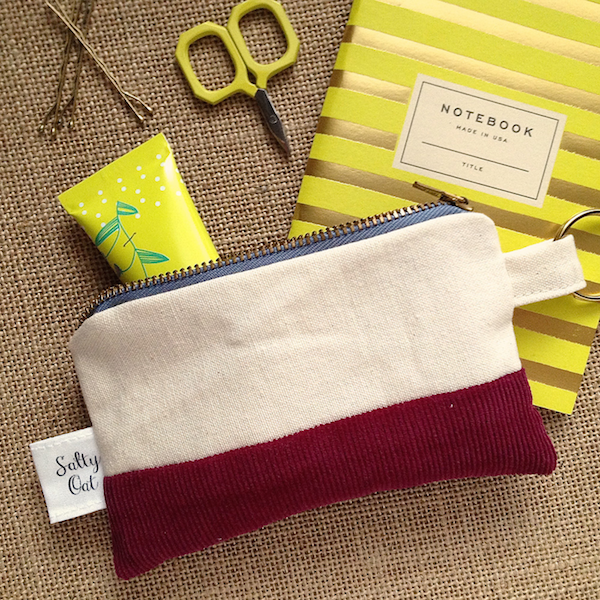 Spoonflower is great for one-off and custom projects your customer would like to commission. 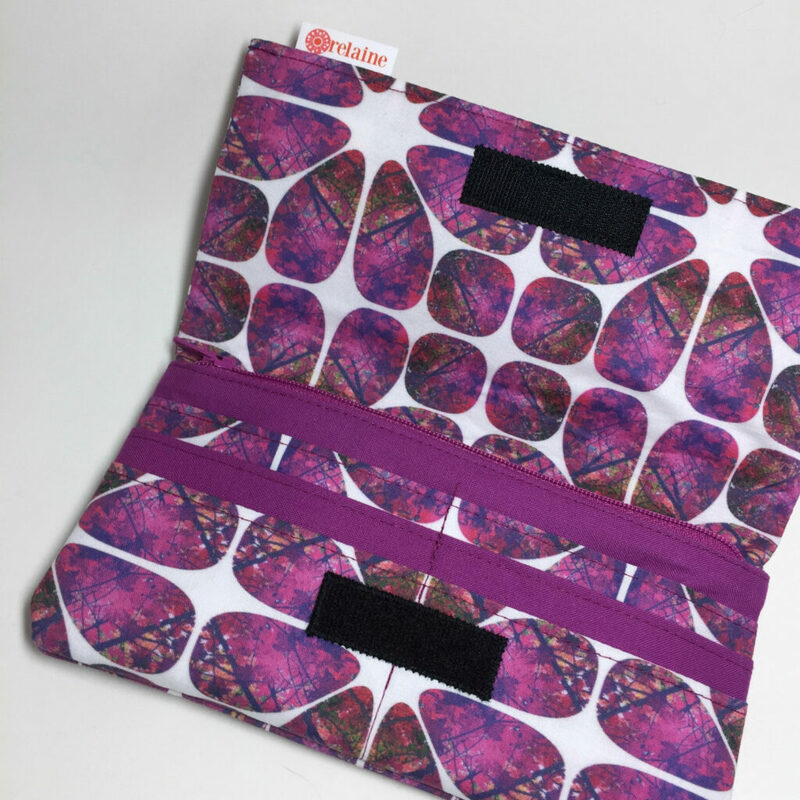 While you might offer products that don’t typically include Spoonflower products, if you do commission work, Spoonflower is a great way to meet the demands of custom orders. Take, for instance, Academy of Handmade member Rita Cheng of Heart and Art Cottage. 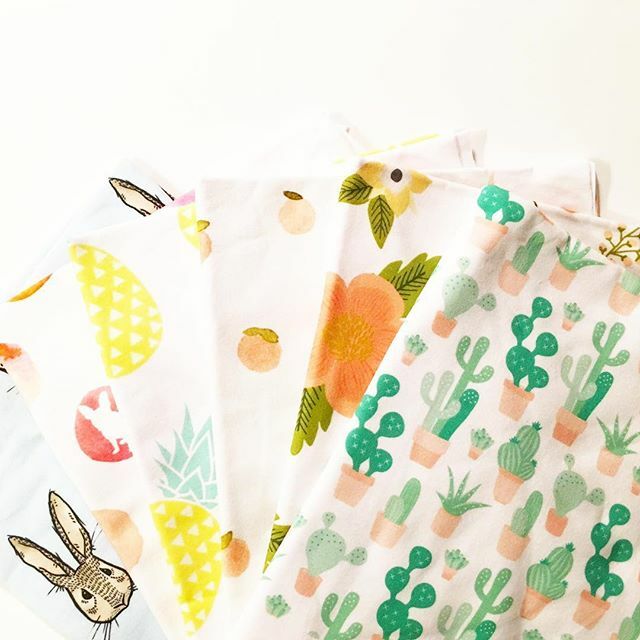 She has a line of baby changing pads and for an extra charge customers can request custom fabrics that she will create to their liking in Spoonflower. She will also soon be taking designs she’s previously done on paper only and make fabric versions as well, further extending her line. There are products you want to create that require the *JUST RIGHT* fabric. Nothing else will do. To make that exact idea become reality, you can design your own through Spoonflower. I love what Academy of Handmade members Jenn of Mods Best Friend and Laura Schuler are doing with their own designs. 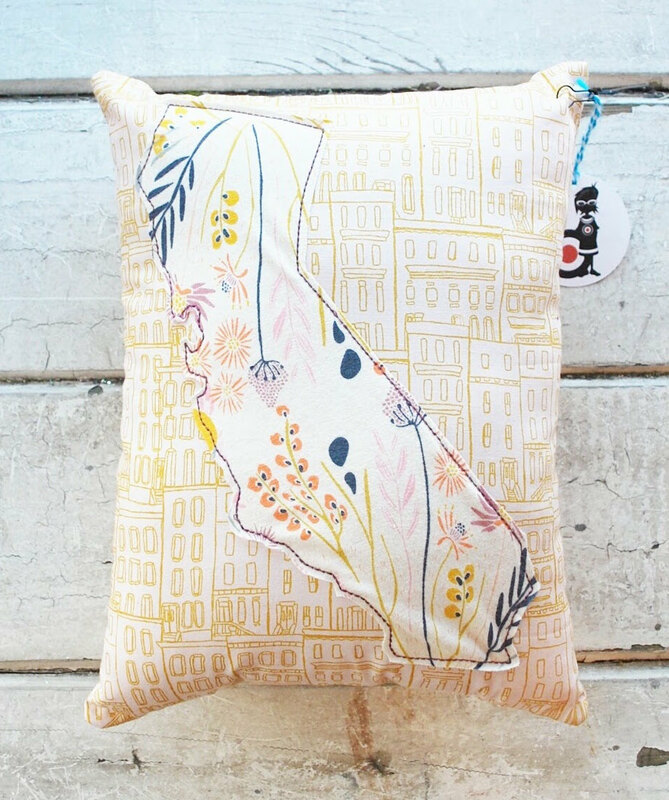 Jenn makes pillows in the shape of US states and is currently assembling a “map” of them using her pillows. She is using Spoonflower to get the exact look of the entire map when it is pulled together. 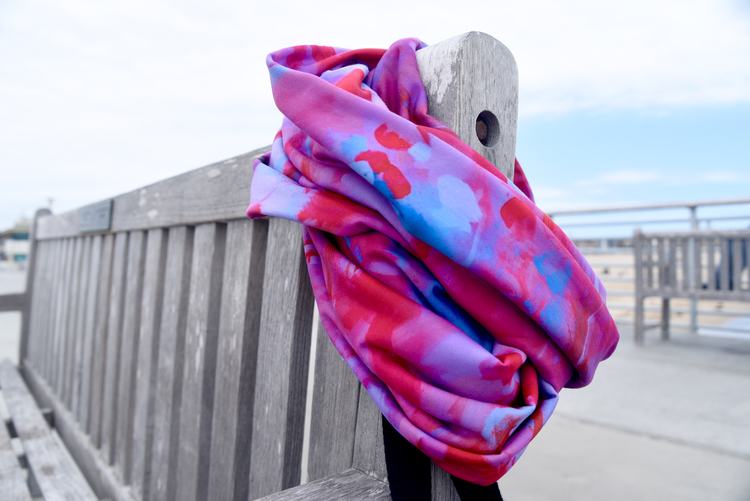 Laura’s infinity scarves are brought into cohesive and distinct line through her designs she prints with Spoonflower. 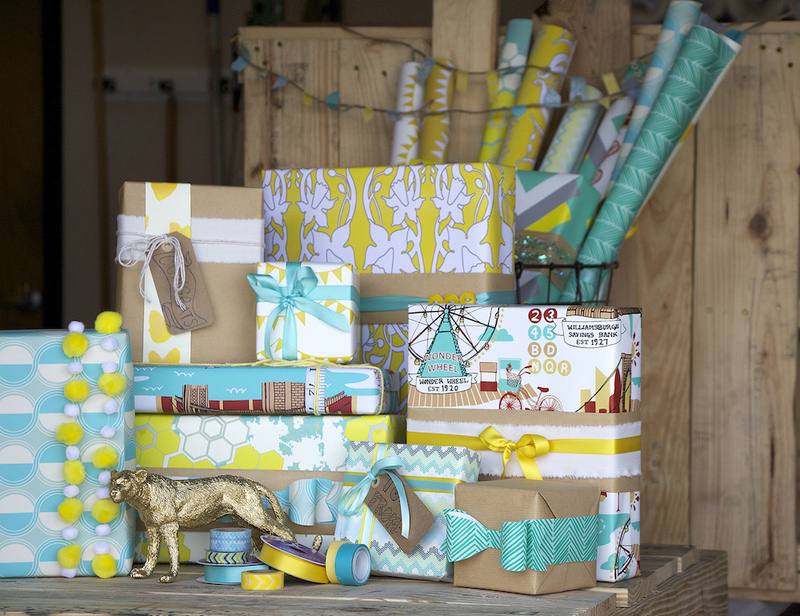 Thinking outside of the literal box, you can use Spoonflower fabric and wrapping paper branded with your business identity to create a professional and unique “unboxing” experience. Of course, you can always wrap boxes, but taking the paper and making branded treat bags, pillow boxes, enclosure envelopes, or even bags. We all get business cards then they wind up collecting our purse or in a pile on our desk. Then we usually throw them out in a fit of sprucing up (tell me I’m not the only one, right?). 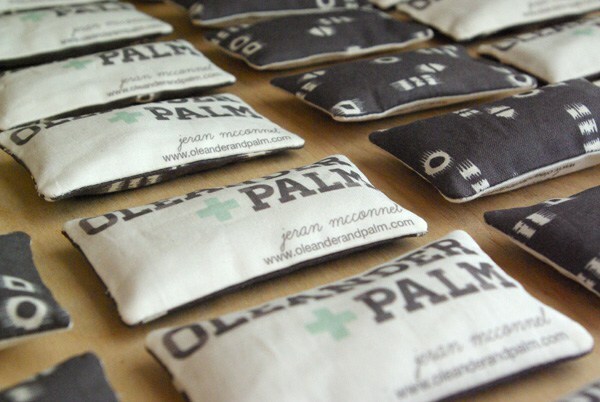 Which is why the Oleander and Palm sachet business cards are genius. And is really a “value add” since customers are FAR more likely to keep this than a typical business card. 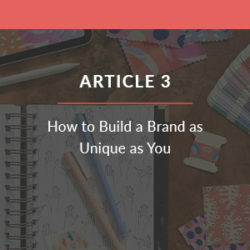 Having your label remain “on brand” is huge. Plus it’s important so that people can find you again to reorder! 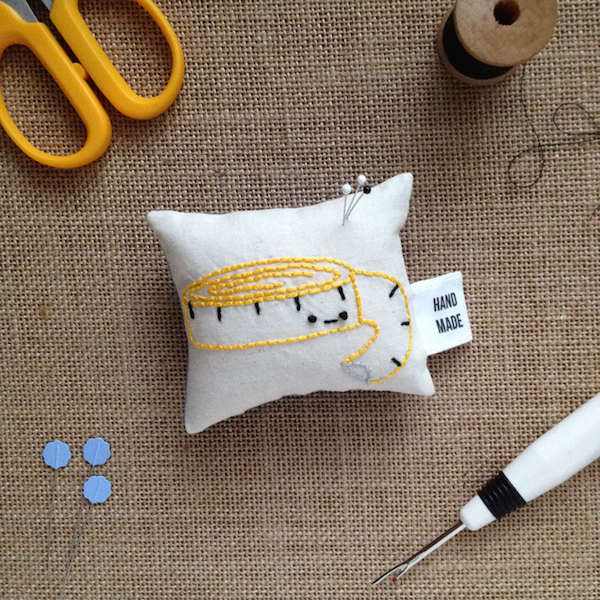 Making the exact right fabric tags for stuffies, pouches and other sewn items has never been easier with Spoonflower. 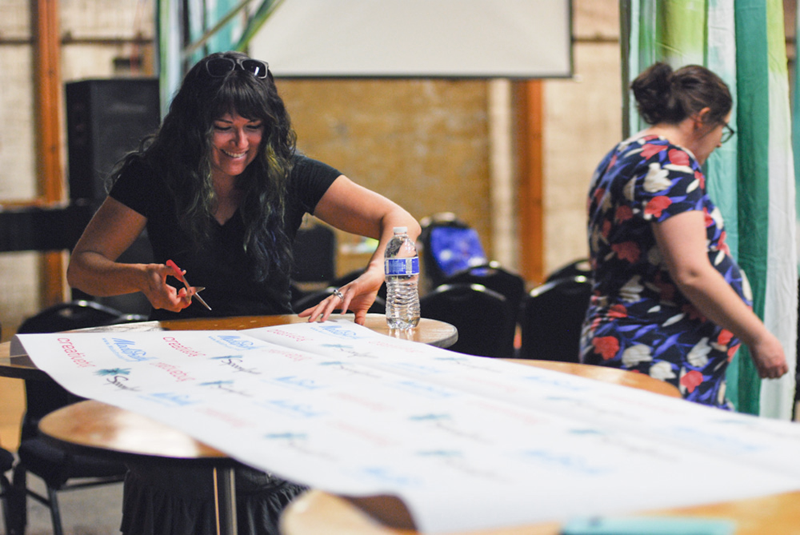 The inspiration and expression of collaborative ideas becomes easier with Spoonflower. Academy of Handmade Member Rebecca of Relaine works with a photographer friend to create patterns from her photography then makes a print from it and uploads it to Spoonflower. The results are stunning! Purple Foliage wallet from the Relaine Etsy shop. 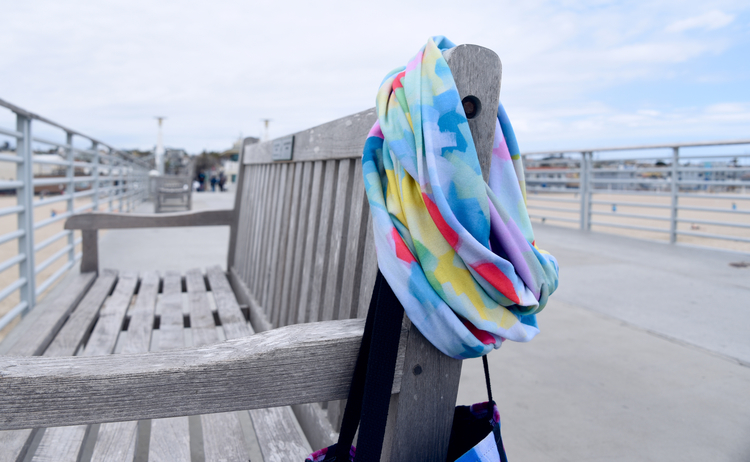 Design by one_sock_photography on Spoonflower. Want to try a look but not get stuck with a bunch of fabric if things don’t sell? Ordering swatches or smaller runs of fabric through Spoonflower can help you test out new product ideas without emptying out your wallet. This is exactly what lingerie maker and Academy of Handmade Member Annika of Married and Bright is doing. She’s recently decided to experiment with new fabrics she couldn’t find anywhere else and absolutely loved. I’ve also used Spoonflower wrapping paper for our photo backdrop at the awards show two years in a row now and I love it! While wrapping paper is a one-time use, you could easily make a longer lasting backdrop for your booth with fabric. 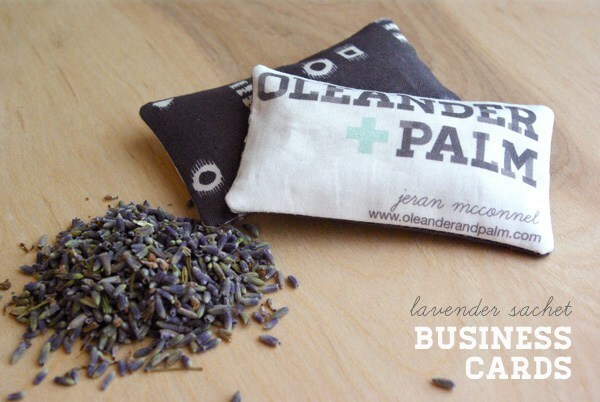 I’d love to know– how do you use Spoonflower in your business? Please share in the comments! Sharon Fain supports and celebrates makers as the director of Academy of Handmade Artists and Supporters, a membership organization for handmade artists and the businesses that support them. Find out more information about the community and get access to a free vault of maker resources by signing up for their email list here. Want to get even more for your business? Become a Spoonflower PRO member today and enjoy premium benefits such as discounts and free shipping. Find out more by clicking here. thanks for sharing, Elizabeth! We absolutely love your plushie creations!! While I do many custom orders, the one that gets the most giggles is plush weaponry…baby viking battleaxes and plush sci-fi guns for baby photoshoots are new Dads faves. I also met an awesome geeky and gory collaborators who have been super fun to work with over the last year! I Love that we can all share in the support of handmade! So keep up the grest work everyone and geek on! Peek at my creations here: http://www.stellarevolutiondesigns.com. I use copious amounts of Spoonflower fabrics for custom upholstery work for my little home business Tango & James. My clients now come to me for the myriad of fun print options I can offer thanks to Spoonflower! Hooray! We love what you do, Lisa! I\’m still trying to figure out how to get pics of my creations on my Spoonflower site. I love spoonflower. So much *sew* that I joined up for the pro version. Living in Australia means that the free shipping quickly pays for itself. I’m currently using my own illustrations to make baby rattles (and dog toys) and am hoping to create some more items soon… I’ve got an order in the mail for fabric to make a cloth book. 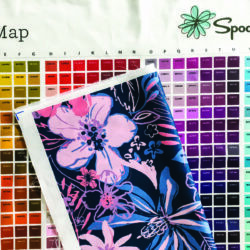 Spoonflower is a great tool that has reignited a creative spark and there are endless possibilities of where to take it. I have 3 Etsy shops selling 3 different lines of clothing, jewelry and headpieces. I have printed a big label with shop name and a little quote, and when I sell any of my dresses, I make a drawstring bag in unbleached eco cotton with my label sewn on, and put the dress in it. It takes like 10 minutes on the serger, and my customers find it very luxurious! Do you print The fabric with a Cuarón design? You certainly can print your own custom design!To learn more about uploading a custom design to Spoonflower, please click here. These are amazing great ideas! My Etsy shop business is completely based on my Spoonflower designs. I used to print them myself, but it was never right. Glad to out-source that end of the business.